It’s finally zucchini season! Zucchini fritters are a great side dish or appetizer any time but especially during the summer when zucchini are abundant and fresh. The most important trick to this recipe is drying the grated zucchini and onion so that you have control of how much moisture is in the fritters. You can grate the veggies either by using a box grater (same one as cheese) or a food processor with a grater. Once the zucchini is grated, mix with 1/2 tsp salt and let it sit for 5-10 minutes – this pulls more of the liquid out. Hooray for food science! Layer four paper towels in a plastic pasta strainer, put the strainer over a shallow container (I use a 9×13″ pan) and pour the salted zucchini on top of the paper towels. Fold the corners over the top and press down to squeeze all the liquid out. If the paper towels are strong, you can pick it up and squeeze even more liquid out. Set the dried grated zucchini aside and do the same with the onion (no salt this time). I find it easiest to put all of the ingredients into a 9×13 pan and mix everything together in there. Draw a grid in the mixture and scoop up one forkful-sized square for each fritter. This keeps the scoops from getting bigger and bigger until the last ones I make are twice the size of the first ones. This trick works for cookie dough too! This makes about 15-20 fritters, depending on how large you make them. I suggest serving with applesauce, apricot jam, sour cream, and/or plain yogurt for dipping. You can even pair them with homemade applesauce! If you find yourself with more zucchini than you know what to do with, check out my recipes for Dark Chocolate Zucchini Brownies and Whole Wheat Zucchini Muffins. Yes, you read that right, zucchini brownies. 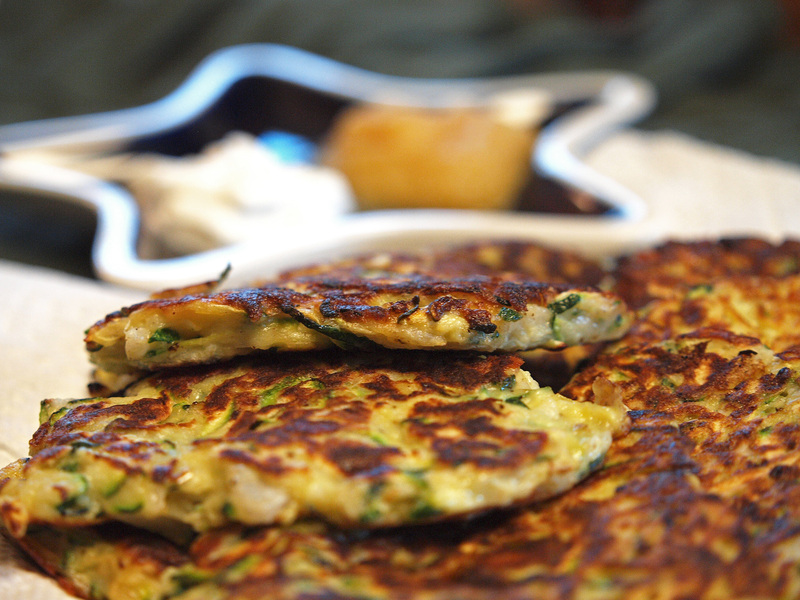 Now go enjoy your fritters and make secret plots to get more delicious zucchini. Local goodies – the zucchini of course – from Hilger Family Farms. Grate zucchini on the large holes of a box grater, then toss with 1/2 tsp salt. Let rest for 5 minutes. Meanwhile, grate the onion. Squeeze zucchini dry using paper towels. Repeat with onion. Mix together zucchini, onion, cheese, flour, and herbs. Season with 1/2 tsp salt and 1/2 tsp pepper. Stir in eggs last. Heat a large skillet over medium-high heat. Working in batches, coat skillet with 1-2 Tbsp oil. Scoop mounds (2 Tbsp each) of the mixture into skillet; flatten slightly using a spatula. Cook until golden brown and cooked through, 2-3 minutes per side. Transfer fritters to paper-towel-lines plates to drain. Serve with plain yogurt and apricot jam or sour cream and applesauce. This entry was posted in Appetizers and tagged beginner-friendly, summer, vegetarian, zucchini.